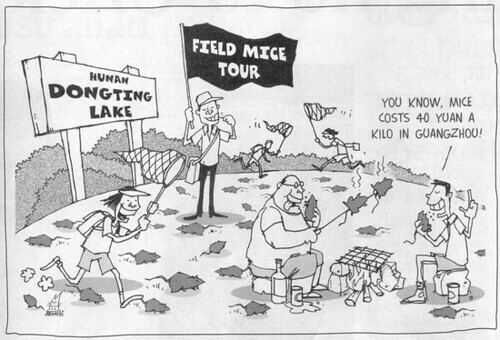 If you think 100,000 kg worth of fish is a lot, wait till you see 2,200,000,000 field mice (by my calculation should weigh a total of 88,000,000 kg!). With heavy fall in recent months, has flooded the burrows that the mice usually live and as a result is forcing them to come further inland and chomping their way through the crops AND not to mention furiously multiplying along the way. The locals are setting dike walls and ditches to trap these mice and imagine a ditch of 30 to 60 cm filled with swarming mice. Imagine the ditch as a stream with brown water and quick ripples. Problem is that the brown water are actually the brown mice and the quick ripples are just the energetic squirming of the mice. On the bright side, the field mice are not as harmful as their city cousins as far as diseases are concerned but given that they are moving nearer and nearer towards civilisation, we have a potential plague time bomb on our hands and that is after that have devoured all the crops meant for human consumption supply. Imagine famine and plague striking at the same time? Reports says that so far 90 tonnes of mice has been killed and again by my calculation, that probably accounts for 0.1% of the mice problem. I won't be surprise that if you throw all the cats into the ditch, it would be the cats ending up as food rather than the other way round. And true to the spirit of the Ch1nese of eating everything, news reports are popping out several days later where restaurants in Guangd0ng are putting these mice back on their tables, given that they are now so cheap, so abundant and so FRESH! Actually, if you seriously thing about it, all these are just our own doing. With the snakes entirely harvested for the restaurants, the mice have thus no more natural enemies to keep their population in check. We messed with Mother Nature by breaking the natural order of the food chain and now we are paying the price for it with the invasion of billions of mice. Afternote: A later report said that the number of mice is set to rise even further as we enter the monsoon months starting August, where the water level in D0ngT1ng Lake, from the increase rainfall is likely to rise even further and thus, forcing even more mice to surface. p.s. My thanks to Little Dowager* for introducing Wulffmorgenthaler. I love it! I sure if they replace all chicken with mice and sell them cheap cheap, this problem will be old news in a week. what's wrong with eating them? they feed on grain and crops. don't waste the protein mah, better to eat them rather than just kill them. Little Dowager*: I recall a news article a few years ago where they use alley rats and cut them up, dye them and roast them to look like roasted pigeon. In Ta1wan, there used to be push carts where they operate a dice gaming stall. Win and you get their grill sausages. It has been rumoured that some of these stalls use alley rat meat to make those sausages. Kelly: Yeah. Me too. Not a big fan. I use to trap rats when I was living in landed property. Cage traps are definitely better than the snap traps. The latter can get very messy. Akk: Yes they may be field mice but given the badly polluted environment that they are breeding in, I don't think it's a good idea to be consuming these critters. slurp! : Mice are generally timid. The "bite back" one are usually the larger rats but only when threatened. Very rare though.